Characters you can relate to. Begin your love affair with Healing Springs for FREE! 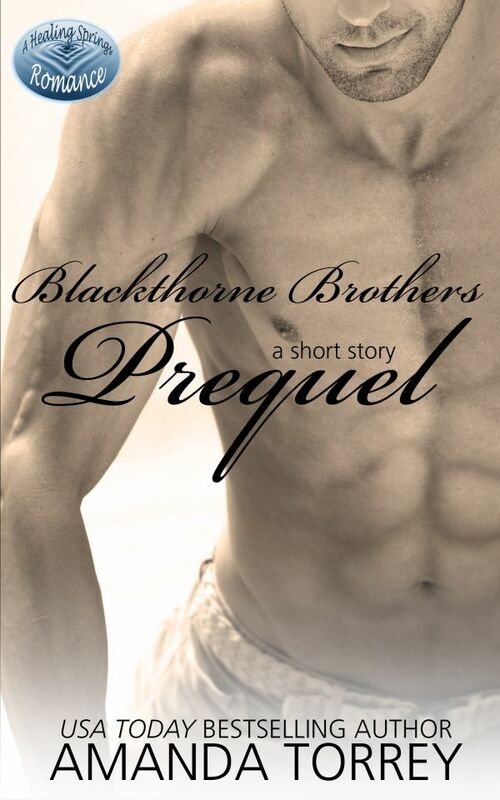 In this short story prequel, the Blackthorne brothers wrestle with the decision to return home after a long absence. When not writing, Amanda enjoys spending time with her kids and her real-life hero. She loves reading, playing in nature/hugging trees, obsessively checking Facebook, taking road trips (especially the kind that make everyone around her question her sanity), playing with her puppies, going to the movies, and binge watching her favorite shows. Amanda is in love with elephants and Disney World, and she is a true believer in happily-ever-after. She is put into an instant good mood when people are unexpectedly kind or polite, and thinks there's nothing greater than connecting with a stranger through a smile. She loves meeting new people, and especially loves to hear from readers! Amanda began writing reluctantly (when the voices wouldn't stop telling their stories until she agreed to write them down!) Now she loves it, and she spends all of her free time thinking of make-believe worlds and trying to bring them to life. Her mom is also an author (she writes under the name Liberty Blake), so you could say that writing is in her genes! Amanda's first work of fiction was published by a NY publisher when she was in seventh grade, as part of the "Young Authors of America" contest. The story was titled, "They Called it Dare Mountain." She actually wrote the story in sixth grade and her teacher entered it in the contest. She got "the call" from NY while she was in math class in 7th grade (and when she got called to the office for the phone call, she thought she was in trouble for her overdue library books...) When she got her author copies in the mail, she knew the joy of being a published author. She didn't mind getting the fan mail from students across the country, either! Besides writing, Amanda works as a preschool teacher and also has a small birthday party/event business, where the main focus is "make-your-own-stuffed-animals." Kids bring the stuffed animals to life with various character traits, such as loyalty, kindness, manners, and more--super fun! Amanda is a little too addicted to baked goods (gluten-free), peanut M&Ms (and her most recent favorite--Snickers Peanut Butter Squared...Seriously--who is the evil genius who invented that? ), and other yummies. She wishes she could be addicted to broccoli and spinach instead. Amanda has the best friends in the entire universe. She learned in high school that quality was so much more important than quantity. Amanda is a sucker for any romantic comedy. She also enjoys a good superhero movie. She doesn't like graphic, realistic, bloody violence. Amanda is a natural redhead, but never heard the term "ginger" until last year. (She heard plenty of references to "Carrot Top," though!) None of her children were born with red hair, but her firstborn nephew was (even though her sister is not a redhead)! Yeah, she said "ten things," but Amanda doesn't always follow the rules. (Some may call her a bit of a rebel; she prefers "free spirit.") Amanda loves to hear from readers, and hopes you'll take the time to contact her!